Pictured are Christine Hamill, Head of Retail Cards at Bank of Ireland and Susanne Carberry, Director of Revenue Management at Aer Lingus. 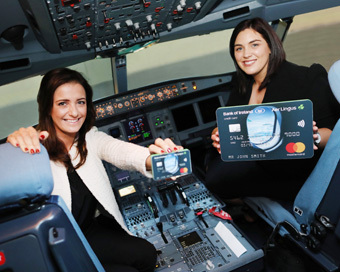 Aer Lingus and Bank of Ireland, two of Ireland’s biggest and best-known brands, have partnered to launch Aer Credit Card, Ireland’s newest travel rewards credit card. Aer Credit Card offers all the convenience of a regular credit card but provides travel rewards for consumers including two free return fares, two fast track and priority boarding passes, two lounge passes, Worldwide Multi-trip Family Travel Insurance. Terms and conditions apply.